For the record, here’s my recipe for making coffee with an Aeropress using the inverted method. Set up Aeropress upside down. The plunger should be set at approximately (number of cups + 1), to leave a bit of working room. Place a filter inside the cap. Leave the cap aside. Add water (90 °C - not boiling) water slowly , so that coffee does not burn. The amount of water for each cup is a little over the distance between two marks on the chamber. For example, for 1 cup with the plunger set at the middle of , fill to a little over . Stir with paddle to mix and remove lumps. Twist the cap onto the chamber. Put cup or jug on top of cap and invert quickly. Press plunger with steady force. The chamber will hiss as air is released. Continue pushing until hissing stops. This will take about 10 seconds for a single cup, longer for more cups. Hopefully there should be a very small amount of crema in the cup. Confirm that you want to deregister. Enter your Amazon account details and click Register. Note that these instructions are for the Kindle desktop app, not the Kindle Windows 8 app. Many of us have been around our local church for a long time. Some of the people we see at church have grown up with us since childhood. Others may have joined while we were at school, where we get to see each other more often than almost anyone else we know. Some more would have joined recently. Hopefully we would have developed good relationships with people whenever they have joined, so that they could call us real friends, not just Facebook ones. This is all great, it is nice to have people around that we get along with, and can have lots of fun with, and are in many ways a lot like us. But how often do we often stop and think about: is this it? What is the difference between this particular group of friends at church, from all the other friends I have from work, or uni, or whatever other social setting I belong to? What is so special about this particular group that I should care about, more than any other group? Sure, we are all Christians, which make things different and special, but what does it mean to be together and relate to each other as Christians? This article is titled More than Friends, because that is what I hope we will discover—that we, as God’s people gathered together, are more than just friends. I want us to rethink what we should expect to put in and get out of the relationships we have with each other at church. I suspect that for many of us, and many churches, it is something that we need to be both thankful for, but also something we need to work on. I hope this article will show us one thing—one thing about the Christian life that is fundamental to our being, and what this means for us as we live together as a church. How do you describe the place of a Christian before God? The usual way we answer is that we are right with God. We were guilty of sinning against God, and deserving of his punishment. But Jesus bore the punishment in our place on the cross. And so we now no longer guilty in God’s sight, Jesus’ death completely washes us clean, and we now wear his righteousness. We have been saved, we have been justified. John was writing to the church in light of false teaching. He wanted to assure them that Jesus has saved them, and so they should continue to follow him confidently as they become more like him. But look at how John describes us, as those who follow Jesus: God’s children. God is our Father. Just like Jesus, who called God his Father, we can now call God our Father. I will sing hymns to you in the congregation. Here, the writer to the Hebrews tells us that because we have been sanctified by Jesus, we share the same Father as him. Jesus is not ashamed to call us brothers. Therefore, we are all in the same family—we have the same Father, we have the same brother in Jesus, and we are brothers and sisters of each other. Consider this: what is privilege it is to be in the family of God! God could have just left it at justification—“OK, you’re now not guilty, off you go”—but he did not. He said, “Come into my family. Be near me. Share in my glory and in the inheritance.” He elevated us to a level of intimacy with him that is higher than anything we could ever experience: an intimacy that is only reserved for Jesus and his people. As people saved by God, we are now in God’s family. God is our Father. Jesus is our brother. Let us revel in it. Now, what does it mean to be brothers and sisters? Consider how we respond differently to the same situation, but involving friends versus family. Quite often we would respond to a situation differently if it involves our family, especially close family, as opposed to our friends. For example, if one of your close family members is in financial trouble and asks you for a loan, you are probably more likely to give it to them than if a friend or work colleague was in the same situation and asked. We treat our family differently compared to our friends, because the nature of the relationship is different. We value them differently, and there are situations where family are the only ones you would turn to. You choose your friends, but you cannot choose family. If we know the difference between our friends and our human family, should we not be mindful of the even bigger difference when it comes to our spiritual family—our brothers and sisters in Christ? While they are both kinds of relationships, just as apples and oranges are both fruits, but they are completely different. 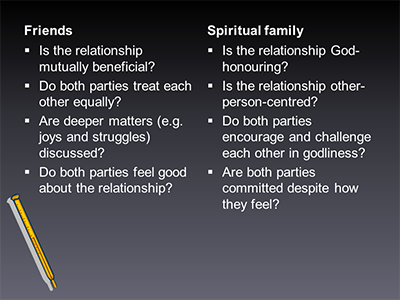 Our relationships with our spiritual family is not based on a shared university or employer, or shared home location or lifestage or interests, or even shared genes. Rather, our relationships are based on our adoption as God’s children, our shared Father in God, our shared brotherhood in Jesus. Because of that, our spiritual relationship with each other is a greater kind of relationship than friends, or even our human family. Friends and family are great gifts from God, but it is our relationship as God’s children, as Jesus’ siblings, as brothers and sisters in Christ, that testifies to the glory of God’s goodness into eternity. And so it would be inadequate and dishonouring to God if we merely treat our brothers and sisters in Christ in the same way as our friends. It misses the point of why God gathered us together like this in the first place. It is like going to a wedding and chatting to the bride and groom as your friends, but forgetting to congratulate them for getting married. I suspect that for a lot of us, we have the wrong expectations from our relationships at church. We expect people at church to be our friends—that we should all get along, have fun, and nothing more. When the relationships do not meet our expectations—when relationships get difficult, when we do not get along with everyone, when there are clashes in personalities, when we are rebuked—we get disappointed. We sulk. We get bitter. We shy away. Sometimes we leave. We should expect better. We are more than friends; we are family—spiritual family—brothers and sisters in Christ. We should expect godly, distinctly Christian relationships from each other. The quality of our relationships should not be measured by how much we get along with each other, rather, it should be measured by how much we encourage each other to grow spiritually in the family of God. The following diagram is a comparison. On the left hand side is a list of things one may use to evaluate a friendship. While the list may be pretty good, but it is not what Christian relationships are about. On the right hand side is a partial list of things one may ask when evaluating a Christian relationship. Notice how it is not about how close one is to each other, rather it is about how one are helping each other draw closer to God. This has all sorts of implications in the way we relate to each other. Just one example: I suspect that some of us have not taken spiritual care of our brothers and sisters at our own churches as we should. We may get so carried away with our own social circle that we have neglected those outside. Negligence of our brothers and sisters is not appropriate in the family of God. It is not God-honouring. I also suspect that some of us are genuinely disappointed with the relationships we have at church. We may feel that we have been neglected. We may have been wronged in the past, but healing has not come. We may grow bitter at a result. But bitterness against our brothers and sisters is not appropriate in the family of God. It is not God-honouring. Let’s change. Let’s recognise the ways we have dishonoured God and repent. Let’s expect better from our relationships at church. Let’s value each other as we really are—children of God. We are in God’s family. God is our Father. Jesus is our brother. Pretty nice people I would imagine. Nice job, or maybe doing nicely at school or university. Nice husband or wife or boyfriend or girlfriend. Some with decent kids, too. Seems to get along well with friends and family. Involved at church, at Bible study groups, in ministry. Nice, godly people. Nice to hang around with. You would count a lot of them would be your friends. Maybe from time to time you would them how they’re going. They seem to be going alright, too. Sure, sometimes you would hear about some of the problems they have, and you would pray for them, but they seem to be on top of it. All very decent, all very nice. But if we are really honest with ourselves, we know that it’s not true. Not least because it’s not true for ourselves personally. We have our problems and worries. We endure suffering, anxiety, worry, loss and pain. Sometimes these things go on for years. We struggle daily with sin, burdened by yet another failure. We’ve got all these idols that a lot of the time we don’t even know we have, but show up every time we speak or act or feel. But we try to hide behind our public mask of niceness and respectability. We hide because we want to look like everyone else. We hide because we are either too proud or too ashamed to admit our sinfulness. We hide because we think it’s not a big deal, or it’s private, or it doesn’t affect anybody. Sometimes we’re so used to it we don’t even realise we have our masks on. At other times we accept other people’s masks, because we’re too embarrassed or don’t know how to probe behind them. And so we end up with all these masked people having nice conversations about movies and shopping and games and clothes and gadgets and family. But, you know, we see right through it. We feel that people here don’t really know us, don’t really share our joys and sorrows. We feel disconnected from other people at church, even though they are friends whom we see every week. I imagine that this is something we want to change. We want to develop genuine Christian relationships, rather than just having relationships among Christians. We want to be each other’s spiritual companions, where we are comfortable in helping and rebuking each other, rather than just being friends. We want to help each other to change and grow, and receive help in changing and growing. I want to show you through this article that change happens when we target our hearts with the gospel. And he [Jesus] personally gave some to be apostles, some prophets, some evangelists, some pastors and teachers, for the training of the saints in the work of ministry, to build up the body of Christ, until we all reach unity in the faith and in the knowledge of God’s Son, growing into a mature man with a stature measured by Christ’s fullness. Then we will no longer be little children, tossed by the waves and blown around by every wind of teaching, by human cunning with cleverness in the techniques of deceit. But speaking the truth in love, let us grow in every way into him who is the head—Christ. From him the whole body, fitted and knit together by every supporting ligament, promotes the growth of the body for building up itself in love by the proper working of each individual part. Paul has just explained God’s great plan for the universe and our place in that plan as God’s people in chapters 1-3. We are a people who have been transformed by the gospel from death to life. And so he now shows us how this plan works out in our lives. will grow in every way into Jesus, who is the head of the body, the church. See what God’s doing? He is changing his people to be like Jesus. Having raised us out of the clutches of the evil one, and he is now transforming his people into one who is worthy of the inheritance that the gospel brings: worthy of being Christ’s body; worthy of God himself. And so change is possible, because God is doing it. Maybe you are worn down by a particular sin which just doesn’t go away. Maybe the relationships with your husband or wife, boyfriend or girlfriend, parents or children are far short from what God wants them to be. Maybe you are carrying around the burden of emotional pain and brokenness. The gospel proves that we can change. The same power that God shown in raising Jesus from the dead, in raising you from the dead, is now working us, to bring us to maturity in Christ. So take heart! Take courage! Change is possible, and it will happen. The gospel guarantees it. Another thing to notice is how God changes people. He doesn’t just push a button and it all happens automatically. Rather, he uses his people to change people. Come back to the passage again. What are the people who are given word gifts supposed to do with them? Are they just to keep it to themselves, satisfied that they are gifted in knowing the word of God? No! They’re to use their gifts to train the saints in the work of ministry and to build up the body. What are the saints then to do after they have been trained? Are they just to sit there and absorb all the teaching without doing anything about it? No! They are encouraged to speak the truth to each other in love, in order that the whole body may grow in every way into Jesus, and that it may build up itself in love. The body only grows when each part does its work. It is in our ordinary conversations that change happens, when we speak God’s word to each other, when we confront each other with our idolatry, when we present God himself to each other. That’s right: our everyday interactions, whether it’s in a crowd or just one-on-one, can have enormous power for change. What an enormous privilege it is that God has chosen us as his instruments to change people. What an enormous privilege it is to have such power flow through us. Think of what would happen if we actually take hold of this power. Think of the conversations we’re going to have. Think of the encouragement we will be getting in the midst of our suffering. Think of the progress we will make when our fellow brothers and sisters find where our idols are hidden, and prayerfully help us to change. Think of us, as God’s people, really sharing our lives with each other as we journey towards perfection. Sometimes we are oblivious to this privilege. We go on living life in our little worlds, not aware that we are part of something huge—participants in God’s grand plan in transforming his people. At other times, we are unprepared to speak the Word of God to people in their situations and relationships in our everyday conversations. How about we spend as much effort in preparing to offer spiritual guidance in our personal interactions as we spend in preparing our other ministries. So we can offer more than a listening ear, a heart of compassion and a willing to help, although they are great things. We can offer the transforming power of God’s Word. Let us not squander the amazing privilege God has given us, and use the opportunities in our conversations to channel God’s power in changing people. Let us be prepared to speak God’s truth in all our relationships. So, how do we help people change? It would be useful to begin by looking at what makes people tick. Jesus is saying that people’s fruits, their actions and even emotions, are driven by their hearts. Those with good hearts will produce good fruits, whereas those with bad hearts will produce bad fruit. Even when something that we cannot control happens, whether good or bad, how we feel and how we react to that situation is driven by our hearts. As an example, suppose you are running late for work and a friend rings you up out of the blue with some pressing need. Now, if your heart values work, then you would feel annoyed at the interruption and so you would fob it off as quickly as you can, so that you can get to work. Or, if you have a different heart, you may have compassion and so you could spend time with your friend dealing with those needs. And so whatever controls our hearts controls our emotions and behaviour. What this means is that if we want to help people get lasting change, we have to target their hearts. It is no use just to get people to change their outward behaviour or even change their circumstances, as these things, while good, will not have a lasting impact. That is why a lot of the time when we try all sorts of things to change people, whether by accountability structures or even threats and bribes, it doesn’t work, because they don’t target the heart. We target the heart by finding out what’s really controlling people’s hearts and where it needs to change. In other words, we find out what people’s idols are and expose them, and help people put God back in his rightful place as the ruler of our hearts. For this is the core of the problem—there are so many things that compete for the attention of our hearts. We have an amazing ability to elevate our desires to become idols, often without us being aware of it. Once they capture our hearts, they produce all sorts of anxieties and emotions and sin. Take an example: the desire to be financially secure. There’s nothing wrong with this desire. But when this replaces God as the ruler of my heart, then all sorts of conflict happens. I become irritated when someone asks me to be generous, because that gets in the way of financial security. I would lie and cheat in order to get it. And I would feel bitter and get worried when something happens that threatens my financial security. But God is more jealous and more powerful than these idols. He will simply not put up with having other things rule our hearts instead of him. The good news is that he is intent on working powerfully within us, through his Spirit, to recapture his place in our hearts. Therefore, the way we help people change is not really to present an explanation, or strategies, or techniques on how people could deal with and solve their problems. Our job is to help people see what is really ruling their hearts, and to present God as both the one who demands our hearts and the one who can works in us to do just that. In the end, we can’t change our own hearts, let alone other people’s. And so we must fall on our knees in prayer, that he would change our hearts, and use us to change the hearts of others. Back to the question at the beginning of this article. What kind of people do you see when you look around your church? What you see is a bunch of broken people, a people whose hearts are struggling with multiple allegiances, a people who need help to change. Yet at the same time you see a bunch of people dearly loved by God, on a journey to grow in maturity in Christ, having their hearts cleansed and recaptured to God, and being used by God to help change others. God is working in all of us, in every situation, in every relationship, for his purposes, to build a people for himself that is worthy of his glorious Son. And he cannot be stopped. It is not easy to expose ourselves and be vulnerable, to be willing to let others point out our idols and accept help from others to change. It is not easy to be courageous and confront people and have those difficult conversations about idolatry. Exposure can be frightening. Therefore we must that God would powerfully work in us, to overcome our fear, to trust him in his work. It’s time to forget masks. It’s time for change. We live in a world that thrives in extroversion. As a society, we look to those who are talkative, charismatic and gregarious to be our role models and leaders, whether in politics or business or entertainment. Even at church, the way we present what a Christian life should be run the risk of extolling extroversion as the norm. I don’t fit into any of those categories. Over the past few months I have been doing quite a bit of thinking on how introverts should approach Christian ministry—an activity that inherently involves dealing with people. And so these two books provide useful insights on introversion. They explore the nature of introversion, how Western culture (including churches) discourage it, the strengths that introverts bring, and how introverts can live life as introverts. 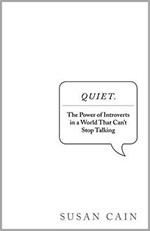 In Quiet, Cain explores the history of the cultural elevation of extroversion and the biological factors which strongly influence introversion. After a brief detour on extroversion in Asian cultures, she then moves on to explain how introverts can act and communicated like an extrovert temporarily as the need arises, and deals with some practical issues about dealing with people with other temperaments, and with introverted children. 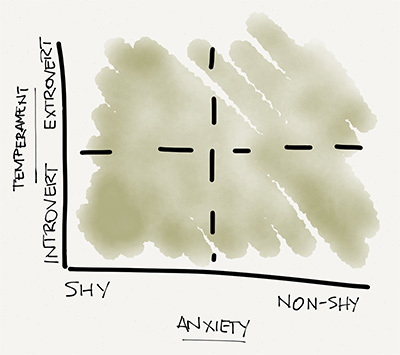 One of the most useful insights is that Introversion is different from shyness. Introversion is a temperament that is associated with, among other things, preference for lower levels of external stimulation. It is an inherent trait in people and is influenced by neurological factors. Shyness, on the other hand, is a condition that is associated with the fear of social rejection. And so you can have shy introverts as well as non-shy introverts. What this means us that the ways (both psychologically and spiritually) of managing introversion and shyness are different. For introversion, it’s about structuring the timing, frequency and type of interaction you have so that you can recharge. For shyness it’s about learning whose opinion really counts (which this short book is particularly helpful). The other useful contribution of the book is dispelling the myth that being quiet in social settings means not participating, or being anti-social. As McHugh recalled in his book an introverted daughter saying to her mother, “It’s never quiet in my head.” Introverted people are participating in their quietness—just differently. They are observing, processing, finding links and meaning to what’s been said. They are the ones who will provide the insights when others have all but forgotten what’s being said. Which leads me to the next book, McHugh’s Introverts in the Church. In addition to laying some of the same groundwork on the nature of introversion, he examines what this means to several areas of Christian life: spirituality, church, leadership and evangelism. I’m surprised that I was a little disappointed with the book. Perhaps it’s because it was written from an American perspective, where evangelical churches are much more extroverted than the ones in Sydney. But I think that the different models for Christian life presented in the book are a bit of an overreaction to the extroverted culture, and may risk unintended consequences. Take, for example, the areas of spirituality and Christian meetings. 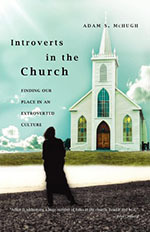 McHugh suggests that introverts may find contemplative spirituality (including sensing God at a level transcending words) and non-verbal styles of services more attractive. Maybe they do, but I would think that this may confuse the issue. Introverts generally don’t have a problem with words, but with overstimulation by having too many things spoken out loud at once. Given that God speaks to us in these last days in words-as-flesh, it may be more useful to look at quieter ways of engaging with God in words, rather than moving from words altogether. I was originally hoping for a ready-made guide to Christian ministry for introverted souls. I did not get that. However, both books provide an interesting start on my thinking through these issues. I’ll post the fruits of that thinking here, so stay tuned. As part of the recent update to this blog’s theme, a new set of webfonts was put in place. It took a bit of time to figure out a way for the webfonts to render properly in all browsers, so this note provides a set of pointers to resolve some traps for beginners. Firstly, you will need to declare the web font using @font-face in your CSS file. There are lot’s of references on how to do this so that it is picked up by most browsers, so I won’t cover this point here. One of the first traps for beginners is setting the correct content type. Some browsers may not accept webfonts if they are not served with the correct content type. Older servers may not recognise the file name extensions of webfonts, and so the content types may need to be set manually. The other thing to watch out for is cross-origin resource sharing (CORS). If you are hosting your webfont files on a different host from your website, some browsers will refuse to load the font unless the correct CORS headers are sent with the webfont. The following shows the header that needs to be sent with the webfont so that they can be loaded through sites on a different host. You can replace the asterisk with a scheme-host (i.e. a URL without the path component) if you want to restrict loading to a particular host. About this time last year, the hosting of this blog was moved from a classic hosting provider to Amazon Web Services, using its free tier offering. Sadly, the computing power provided by the micro instance just wasn’t quite enough to power this blog at the speed I wanted, particularly with the other things that I was putting on the server. And so, I’ve migrated the hosting for this blog to OpenShift. There wasn’t much effort involved, and to you, dear reader, it’s pretty seamless. And it’s free, too. Interestingly, as an Australian user, I can access Yahoo! Mail using POP3 for free, whereas my American counterparts cannot (without purchasing the Plus Pack).